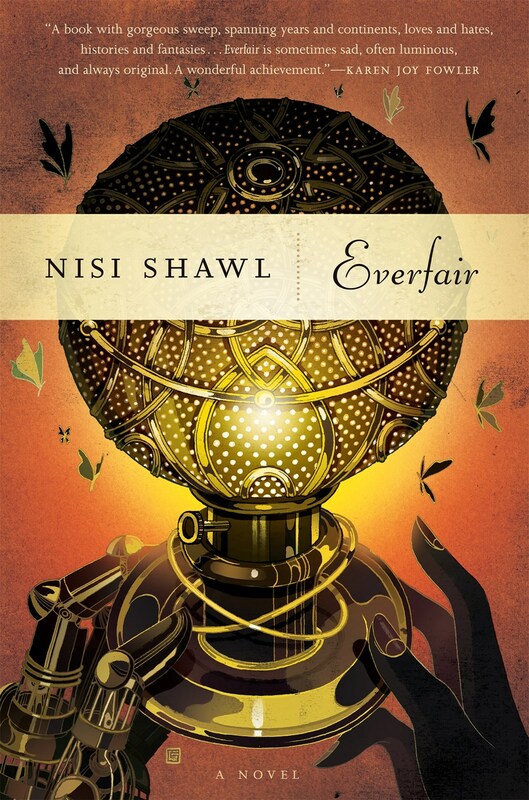 Everfair is a story that spans decades and continents. It tells the history of a country that never was, one where “Fabian Socialists from Great Britian join forces with African-American missionaries to purchase land from the Belgian Congo’s “owner,” King Leopold II. This land, named Everfair, is set aside as a safe haven, an imaginary Utopia for native populations of the Congo as well as escaped slaves returning from America and other places where African natives were being mistreated.” (source) It lies across blurred genre lines, at the meeting point of steampunk, historical fantasy, and alternate history. Everfair is told through a multitude of voices, from King Mwende to Lisette Toutournier, Reverend Thomas Jefferson Wilson to Martha Hunter. It is in a sense the story of an idea, a different kind of grand experiment, more than one person or their personal experience. At first this was disorienting for me–I’m very much a character-based reader. But I realized that in fact that this is the point: that Everfair the country is herself the main character, and that the patchwork of people who make up her history are telling her story, rather than their own. So, the main emotional arc is not exactly that of Lisette, or of Daisy, or any of the others. It is of their collective experiences, their various viewpoints, coming from different backgrounds, races, beliefs, and genders. This approach also lets Shawl resist flattening any one character into a type. Each of the sympathetic characters shows flaws as well as greatness; each of the less sympathetic characters shows greatness as well as flaws. Although the characters are in some ways secondary to the history of what they made, they are not comforting. They also challenge the reader and the reader’s assumptions. We see Daisy’s limits when she cannot look beyond her own whiteness. We also see Martha’s real care and worry for George later in the story. Neither the country nor the characters are held to an impossible perfection; it is through the contradictions and flaws that both become real. After finishing the book, I kept thinking about the image of prosthetics that appears throughout the book. It’s one of the most steampunk-y elements: the beautiful, deadly mechanical hands that are made for the survivors of King Leopold’s regime whose hands were cut off. It’s an image that seems to underscore the heart of the book: that the history and trauma that have passed cannot be undone, and yet that the story does not have to end there. That another story, with dirigibles and steam-powered hands, with heartache and work and courage is also possible. In short, I found Everfair to be a reimaging of the past that thinks deeply about implications and patterns. It takes people as they are, and shows the weight and burden of leadership. It is too clear-sighted to truly be a utopia, but it is also hopeful. The ending, full of possibilities, asks us to take up the task of reimagining the world–by both acknowledging the real traumas and looking for the rest of the story. Oh hooray, I am glad one of my blogging buddies finally seems to have felt about this book the way I did. A lot of people found it a little cold, which I can totally see even though it makes me sad, but I was just so in love with the worldbuilding and the history she imagined for this country. Oh my heart.